Shavar Ross wears optical white low cut chucks, and Dominick Brascia, Corey Parker, and Juliette Cummins wear black and red high top Converse “Chuck Taylor” All Stars in the film. 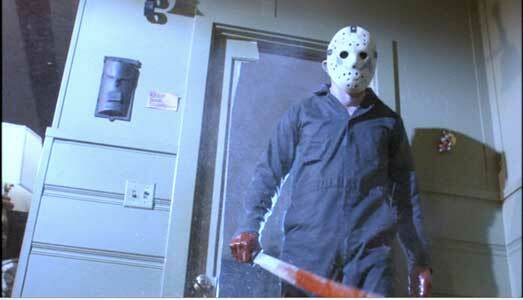 Jason is back in the fifth Friday the 13th film. A New Beginning is the fifth in the Friday the 13th series, infamously coming after a film titled The Final Chapter. The film opens with some hoodlums digging up the grave of serial killer Jason Vorhees, who was killed in the last film. Little Tommy Jarvis (13-year-old Corey Feldman), the previous film’s survivor, watches as Jason comes alive and kills the vandals. He then approaches terrified Tommy, raises his trademark machete, and SLASH! Tommy wakes up! It’s ten years later. Adult Tommy (John Shepherd) is being escorted to Pinehurst, a progressive house for delinquents and misfits run by Matt (Richard Young, who gave young Indie his first fedora in Last Crusade) and Pam (Melanie Kinnaman). Like a certain abandoned summer camp, it’s an isolated location populated by teens. There’s fat kid Joey (Dominick Brascia), nymphomaniac Tina (Debisue Voorhees), hotshot Eddie (John Robert Dixon), insecure goth Violet (Tiffany Helm), normal uptown girl Robin (Juliette Cummins), stuttering Jake (Jerry Pavlon) and angry, angry Vic (Mark Venturini). There’s also a hip child, Reggie (Shavar Ross). In town, there’s hillbilly trash Ethel (Carol Locatell) and her imbecile son (Caskey Swaim). People at the camp and surrounding area are disturbed by the violence that has started to occur. Other figures show up like the sheriff, a pair of medics, a waitress, some black leather jackets misfits, a drifter, and Reggie’s older brother Demon (Miguel A. Nunez, Jr., in an unfortunate early role). You know every single one of them is just fodder, and we’re just waiting for the slaughter. Fun! Tommy settles in. He’s clearly traumatized, haunted by nightmares and visions of Jason. He makes scary masks, and is withdrawn, saying very little throughout the film. The scares kick off when angry Vic takes an axe to simpleton Joey’s back! The medics collect the body. A random incident, or something more? Soon after, it seems that anyone who crosses Tommy is slashed in familiar style. It can’t be Jason Vorhees, though. Jason is dead! Still, people are being slashed, stabbed, impaled, having their throats slit, and, most inventively, one person’s head is crushed with a tightened leather strap. While the counselors try to figure out where everyone has disappeared to, the body count rises up until the grisly finale that leaves only Reggie, Pam and... Tommy! While Reggie and Pam fight for their lives, Tommy confronts the horror that has tormented him for a decade. 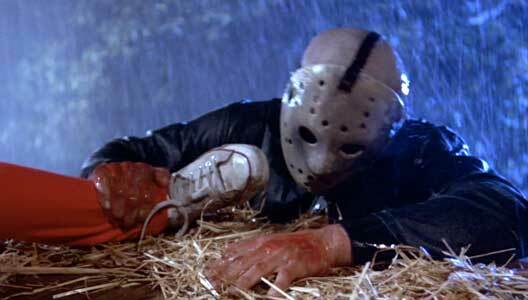 The barn-set climax sees our heroes are victorious when Jason is thrown onto some spiky farm equipment. It’s then revealed who Jason really was, and the twist is satisfactorily absurd. There’s also a set-up for a sequel that was never made, suggesting that Tommy has finally taken the mantle of Jason, which is kind of cool. The camera focuses on Eddie’s black high top chucks as he walks through the woods. Friday the 13th Part V is actually very well-made. We’re expecting scares, but they’re not just dumped onto the screen. There’s real effort to deal the goods here. The kills we’re expecting are drawn out, and sometimes they even come without warning. It keeps things lively. 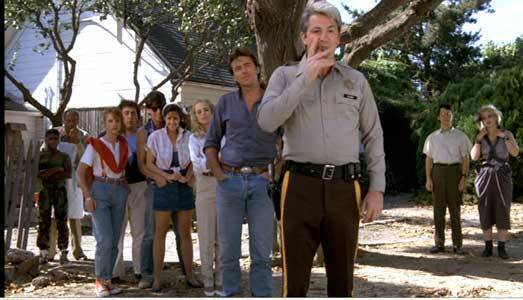 And since we’re dealing with a new killer, it’s more of a basic slasher and less supernatural in nature. A problem is that we don’t actually believe Jason is dead. This is a Jason film, after all. So it feels just very simple until that final twist. Maybe if it had been made explicitly clear that Jason is dead? How high can expectations be when watching the fifth Friday the 13th film, though? It’s satisfactory for moderate fans like me. It offers satisfactory slashes, atmosphere, and great music by Henry Manfredcini. It’s steady and sleek, and fairly clever for a film that has to offer Jason without actually having Jason. There’s also only a modicum of T&A and gore, and an emphasis on atmosphere, which I appreciated. In some very slight way, it could be said this one’s the thinking man’s Friday the 13th. Reggie helps Pam to get up after she is chased by Jason. In his role as Reggie, Shavar Ross wears optical white low cuts throughout the film. Other briefly appearing characters, played by Dominick Brascia and Corey Parker, wear black high tops, while Juliette Cummins is seen wearing red high tops. Converse is given a “special thanks” in the end credits. Jason starts to pull Reggie down. In the final chase, young Reggie runs down Jason in a bulldozer. 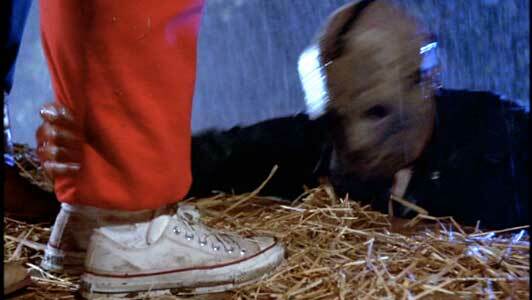 When they go to examine his body, it turns out Jason’s not dead and grabs onto Reggie’s ankle, trying to kill him! This happens shortly later when they think they’ve thrown Jason out of the barn. Reggie looks over, and again Jason grips him by the ankle, determined to kill before Tommy knocks Jason loose, sending the killer to his death. A closeup of Jason grabbing Reggie’s ankle. Friday the 13th Part V: A New Beginning. (1985) Anthony Barrile, Suzanne Bateman, Dominick Brascia, Todd Bryant, Curtis Conaway, Juliette Cummins, Corey Parker, Shavar Ross. Directed by Danny Steinmann. Categories: Horror.